Widows of Peru’s Murdered Indigenous Rainforest Defenders Demand Justice at U.N. Climate Summit | Democracy Now! widow of Edwin Chota, who was allegedly killed by illegal loggers for his efforts to protect the Peruvian forests where he lived. widow of Jorge Ríos, who was allegedly killed by illegal loggers for his efforts to protect the Peruvian forests where he lived. Peru, the host country of this year’s U.N. Climate Change Conference, is facing scrutiny because a new report by the group Global Witness finds it is the fourth most dangerous nation for environmental activists, including the indigenous people who live in the forests and work to protect it from deforestation. Since 2002, at least 57 environmental activists were assassinated in Peru, which recently passed legislation that rolls back forest protections in order to attract new investment and development. We speak with Julia Pérez and Ergilia Rengifo, the widows of activists Edwin Chota and Jorge Ríos, who were killed in September allegedly by illegal loggers they were trying to stop. Shortly before his death, Chota had called for greater protection from the government for communities such as his own, and described how his life had been threatened. Now his widows have traveled from the rainforest to Lima to call for justice. AMY GOODMAN: We turn right now to the story of Edwin Chota, in his own words. He was a leading environmental activist and had been profiled in National Geographic. Shortly before his death, he called for greater protection from the government for communities such as his own and described how his life had been threatened. EDWIN CHOTA: [translated] It is a risk of life or death for us, because if I stand in front of them, in front of the loggers, to represent my community and say to them, “Sir, you have to leave, because this is our land,” it is a risk. And it has been this way for a while. They are loggers. They have arms. They have everything. And they are never going to pay attention to us. We know who they are and how they act. So we need the support of government institutions to protect the region at the border with Brazil. AMY GOODMAN: That’s Edwin Chota. He was killed in September along with Jorge Ríos, Francisco Pinedo and Leoncio Quinticima. Well, here in Lima, I spoke with Chota’s widow, Julia Pérez, and with Ergilia Rengifo, the widow of Jorge Ríos, about the assassinations and the work their husbands were doing. AMY GOODMAN: You’re breast-feeding your baby. Can you tell me his name and when he was born? JULIA PÉREZ: [translated] His name is Edwin Tom Chota, Edwin Chota, and he was born on November 10th. AMY GOODMAN: He is the baby of your slain husband, Edwin Chota? AMY GOODMAN: Julia, what should we know about your husband Edwin Chota’s work? 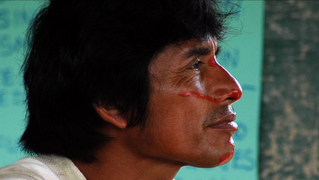 JULIA PÉREZ: [translated] Edwin was dedicated to the community of Saweto. He spent his whole life and all of his time in defending the community, coming here to Lima, going to Pucallpa, writing documents, bringing documents to the government agencies and doing what he could for the community. The community would support him here and there with a bit of money to help him out, but basically he just dedicated his life to the community and to obtaining our title. AMY GOODMAN: Ergilia, you, too, lost her husband. You will soon be elected leader of your community. Talk about what happened on September 1st, as you understand it. What happened to these four men? ERGILIA RENGIFO LÓPEZ: [translated] My name is Ergilia Rengifo López, and I’m here in Lima, and I’d like to tell you the reasons why we’re here and why our husbands were killed. It saddens me greatly that these four leaders of our community of Alto Tamaya-Saweto—I am one of the representatives of Saweto. It saddens me greatly that our four leaders—Edwin Chota, Jorge Ríos Pérez, Francisco and Leoncio—were killed. It saddens me greatly because they leave a great hole, and they leave us as widows and their children without fathers. They fought for the conservation of their lands. They fought for their land rights, for their title. They repeatedly asked the government for their title. The government never paid any attention to them, despite multiple requests. And they also fought against illegal logging on our lands. AMY GOODMAN: Who killed them? ERGILIA RENGIFO LÓPEZ: [translated] The people who killed our husbands were illegal loggers, Brazilians, who operate in that region, who we’ve denounced multiple times, but the government does nothing to stop the situation that’s going on there. We protect our forests. We depend on our forests for fish, for the resources that are in the forest. We don’t live in the city. We don’t go to the supermarket. That is where we get what we need to live. We take care of the rivers, because if you cut all the trees, the rivers dry up. So we protect the forests, that the rivers, where we get our fish, where we use the water, that we depend on. So that’s why we have come here to the COP, is to ask for support, support to protect our forests and, first of all, to title our lands. We’re asking the government to title our lands, but it hasn’t paid attention to us. But that’s what we’re here to request. We also are asking for pensions, because our families have been left without support. Our husbands have been killed. And we need support. I have six children. You know, I need to feed them. I need to get them what they need. So, this kind of support from the government is what we need. AMY GOODMAN: Ergilia Rengifo and Julia Pérez, their husbands Edwin Chota and Jorge Ríos were killed in September along with two other Peruvian environmental activists. That does it for our broadcast today. As we wrap up today’s program, we’ll be bringing you broadcasts throughout the week from the U.N. climate summit. It’s called COP 20, the Conference of Parties, the binding summit next year in Paris, France. Democracy Now! is produced by Mike Burke, Renée Feltz, Aaron Maté, Nermeen Shaikh, Steve Martinez, Sam Alcoff, Hany Massoud, Robby Karran, Deena Guzder, Amy Littlefield. Mike DiFilippo and Miguel Nogueira are our engineers. Special thanks to Becca Staley, Julie Crosby, Clara Ibarra, Andrés Conteris, Denis Moynihan, Hugh Gran, Jessica Lee, David Prude. And our website is democracynow.org. There you can see all of our coverage of climate change, from the People’s Climate March in September, our three-hour broadcast special, everything leading up to today, as well as our past coverage of the climate summits, from Copenhagen to Cancún, from Doha to Durban, as well as the peoples’ summit that took place in Bolivia. We’re here all week in Lima, Peru.